If you are contemplating a home improvement that involves the electricity in your home, you may be required to use AC Metallic Armored Cable, Figure 3. Armored cable has been around for a number of years, initially it gained a bad reputation as there were a number of problems associated with its use. However manufacturing improvements have made armored cable or as it is known in the trade AC cable an acceptable alternative to metal conduit in most jurisdictions. Many of the problems associated with the original armored cable, known as BC cable, were due to installation problems, especially in cutting the metal sheath. 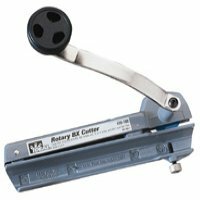 Using a hacksaw or side cutters had and still has a tendency to damage the insulation on the wires inside the sheath or to leave very sharp edges on the metal which could easily create a short between conductors or between the armored jacket and the wires if the installation into the electrical box was not accomplished correctly. This has been remedied by the creation of specially designed tools which cut the sheath without damaging the internal cables, see Figure 1. AC armored cable has some benefits and should be considered in areas where there is a relatively high possibility that damage could occur to non metallic sheathed cables from screws, nails or other sharp devices. One area where cable damage is prevalent is in kitchen walls where upper cabinets are screwed into studs with, in many cases, three and four inch screws. 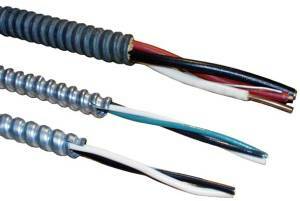 It is much easier to penetrate a plastic covered cable such as Romex than it is an AC armored cable. It is also very important that anti-short bushings be installed in the ends of all cables, Figure 2. The anti-short bushing protects the internal cables where they exit the metal sheath from shorts occurring when the end of armored end of the cable is clamped into position in an electrical box or panel. Many home handymen neglect to install the anti-shorting bushings and end up with damage to the internal conductors of the AC metallic armored cable. Not only does it have the potential of creating short circuits at a later date but it does create a long term fire hazard. In conditions where cabling is exposed, such as the last few feet of a run from an electrical box to a hot-water tank or electrical motor in a furnace the metallic sheathing on armored cable provides an added degree of protection for the wires that are carrying the power. It should be noted, that an equivalent (conductor size) armored cable does not carry any more current than plastic covered cables and armored cable must be properly terminated and clamped into metal boxes not plastic.